Austin Hofeling (right) meets with Lincoln Startup Mentor Chris Kalkowski (center) and the rest of the wheelbarrow business team. Nebraska students reinvent wheel-barrow business with help of business community. On his thirteenth birthday, Austin Hofeling wheeled his way into the entrepreneurial world by starting his own business, Lincoln Mulch Spreaders. He continued down the entrepreneurial path recently at Lincoln Startup Weekend, where he worked in teams with fellow Nebraska students and members of the Lincoln business community to elevate their business ideas. Hofeling, a junior finance major from Lincoln, Nebraska, got inspired to participate in the weekend festivities, sponsored in part by the University of Nebraska–Lincoln Center of Entrepreneurship, because of various defective wheelbarrows he owned over the years. He wanted to make a better wheelbarrow, and he also wanted to further develop his entrepreneurial acumen. On Friday of Lincoln Startup Weekend, participants who wanted to further a business plan, pitched their ideas to more than 125 in attendance. Participants could then pair up with a business partner they liked. Hofeling pitched first and attracted a team of four other students to help build a solution to his wheelbarrow problems – thus, the collapsible wheelbarrow idea was born. After making calls to potential customers earlier in the day, Hofeling realized potential customers might not be interested in his idea. Mentors arrived at the competition on Saturday to coach teams and hone their ideas. Hofeling’s team met with Alex Kuklinski, CEO and founder of fyiio, a local technical software solutions firm, and Chris Kalkowski, vice president of ag lending at First National Bank Omaha. The mentors made a profound impact on what Hofeling’s wheelbarrow business might look like. 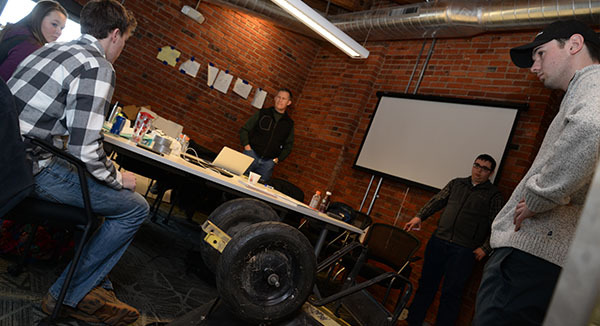 Hofeling (right) listens to experiences of mentor Alex Kuklinski, founder of fyiio, while trying to solve issues for his team's wheelbarrow business. “The mentors challenged our thinking. Each conversation made us realize we’re missing an opportunity of where the business can go. The first mentor made us think about making a better product rather than reinventing something. The next one challenged us to be business people rather than engineers. We started to think about the business as financing wheelbarrows and renting them out. We became a competitor to Ace-Rent-to-Own. Calling customers isn’t going to give you those type of ideas, and that’s why it’s great to have mentors,” he said. Kalkowski, who has mentored at entrepreneurial events in the past, said it was fun to watch the participants challenge themselves. He believes it can be a reciprocal relationship when the wheels start spinning. Kuklinski sees the Nebraska business community transforming to help young entrepreneurs in recent years. Like Kalkowski, the interplay with other business-minded entrepreneurs helps him move ventures forward. Hofeling helped present the culmination of his business venture to a panel of judges at Lincoln Startup Weekend. Dr. Sam Nelson, director of the Center for Entrepreneurship and assistant professor of practice of management, helped facilitate Lincoln Startup Weekend, in partnership with the Lincoln Partnership for Economic Development and the Engler Agribusiness Entrepreneurship Program. He extolled the virtues of bringing mentors in from the business community to work with students. “One thing I hear from the business community is they’re coming from a different place, so the mentors get a fresh way of thinking from the students. The students get a dose of reality on what life is like outside college. Even though it’s only three days, the intensive nature of what they do results in strong relationships. If you’re interested in the process of building a business idea, this is the perfect event for you,” said Nelson. By Sunday evening, Hofeling helped present the culmination of his business venture to a panel of judges. His team, which consisted of agricultural and biological science majors, did not finish in the top three, but the emphasis of learning how to work on an interdisciplinary team and push his business idea forward carried the day. “We were stuck at roadblocks trying to figure out what we wanted to do with this business. It was an honor to work with the team and mentors. It was going to take more than a weekend to figure all this out, but we used our strengths to tackle the issues and make the business better,” said Hofeling. To learn more about the Center for Entrepreneurship, visit: https://business.unl.edu/entrepreneurship.